Our babies sure do grow up fast don't they? It's amazing how fast time passes the older you get. I'm going to blink and this little fella is going to be 18 and heading off to college (Texas A&M University to be specific)! I've definitely been slacking on my posts, he's kept me so busy! We actually turned 4 months old back on April 12th. Just a little behind, whoops! The last time we checked in Peyton had just started daycare and I was getting use to being away from my little man. Well, a lot can change in a month and now I am thrilled to say I am now a stay at home mom, or a work from home mom, if you will. I'm definitely working! I am so happy that I am able to stay home with him during this time in his life. It was the hubby and I's goal to make this happen and we did! Developmentally, I feel like Peyton isn't too far behind other babies his age (since he's 6 weeks preemie). 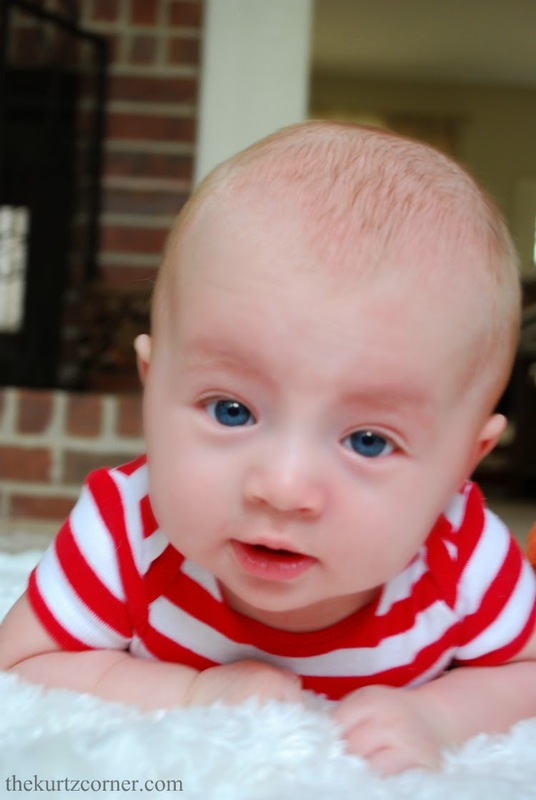 At his 4 month appointment he weighed 14 lbs 8.5 oz and measured 25" long which are both in the 25th to 50th percentile. Then that little noggin of his puts him in the 75th to 85th percentile fro head circumference. I'd say that's pretty good for a preemie! I'm anxious to see how big he is in the coming months because I have a sneaking suspicion this kid it going to be big and tall like his daddy! How cute is this little punkin? We'll be back in a few weeks! OMG !! Payton is so so cute !! He's a doll ~ mashallah. (touch wood) ~ Please keep sharing his photos with us. His smile just lightens up the screen. I have 3 boys myself ~ but they are all in their teens now :( No more chubby cheeks :( Feels like only yesterday, my oldest was this tiny and today he's taller than me :( Feels lovely seeing Paytons pictures.